Those BioShock titles sure have given us some fancy outfits! And the newly released BioShock Infinite is no exception. That's probably one reason why people, especially cosplayers, love the BioShock games. 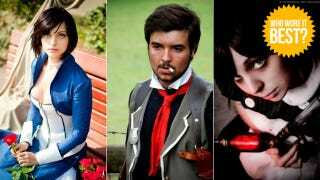 Here is some, but not all, of the best BioShock cosplay this side of the internet. Have a look below as you try to decide which cosplayer pulled off the best BioShock outfit, whether that's from the first games or the brand new BioShock Infinite.